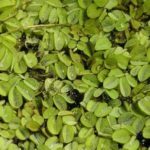 Common salvinia can be found free-floating or in mud. Underwater the leaves are modified into small root-like structures. The entire plant is only about 1 inch in depth. Salvinias are ferns and have no flower. 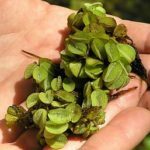 Common salvinia can reproduce by spores or by fragmentation and is an aggressive invasive species. If colonies of common salvinia cover the surface of the water, then oxygen depletion and fish kills can occur. These plants should be controlled. This is a non-native plant that should not be grown as it is invasive and illegal to possess or transport this species in Texas. Please report sightings to the Texas Parks and Wildlife Department at (512) 389-4800.